A sunny wedding day and West Melbourne classic wedding car hire kicked off this beautiful December wedding. 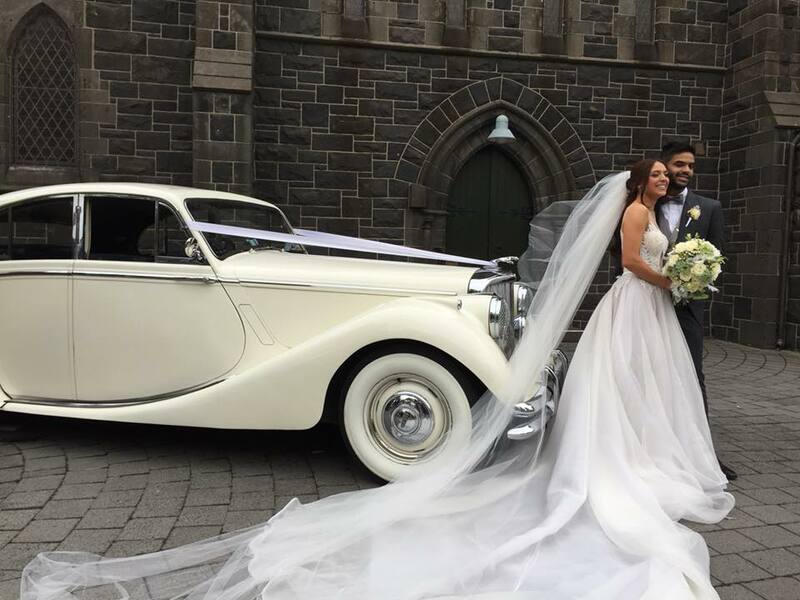 With summer well in progress, Victoria and Dylan tied the knot in front of family and friends, and their West Melbourne classic wedding car hire was the perfect support act. Bringing the best of the city and the water together, this beaming couple began wedded life with a ceremony at St Mary’s Catholic Church, Williamstown. The bride arrived in West Melbourne classic wedding car hire, commanding the attention of all guests and, most importantly, the smitten groom. After the formalities were over, JC Jags transported Victoria and Dylan to their reception at Leonda by the Yarra in Hawthorn. While it wasn’t a big journey, it was long enough for the couple to unwind, spend some time together as husband and wife, and enjoy a relaxing and luxurious ride before beginning the festivities. Victoria looked every bit the model bride, her elegant and understated style perfectly complementing the West Melbourne classic wedding car hire they chose for their wedding day transport. Her dress featured a long train and veil, simple lines and delicate bodice detail. Dylan’s suit was the ideal partner to her romantic style. The floral arrangements were in natural, creamy hues, and completed the couple’s look. The success of their wedding day came down to a number of factors. Love, of course, was first and foremost. The happy couple also paid close attention to detail, and made wonderful choices that all connected seamlessly with each other. For their wedding transport, they chose the 1950 Jaguar MK-V, which was a luxury car well ahead of its time. With flowing lines and an air of opulence, Victoria and Dylan couldn’t go wrong with this choice! The importance of choosing head-turning wedding car hire that is also reliable and service-focussed cannot be recommended enough. When you are looking for the best West Melbourne classic wedding car hire for your big day, you can trust JC Jags. For more information about our wedding car hire options, contact JC Jags today.